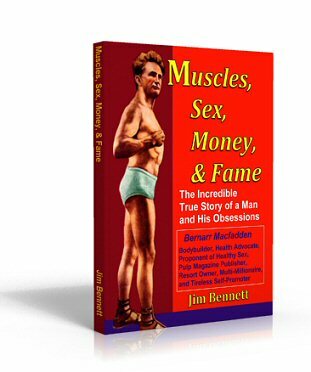 Bernarr Macfadden (1868 - 1955), internationally famous during his lifetime but almost unknown today, called the "Father of Physical Culture," nicknamed "Body Love" Macfadden by Time magazine, was a flamboyant personality, true visionary, millionaire publisher, and life-long advocate of physical fitness, natural food, outdoor exercise, and the natural treatment of disease. He inspired millions of people around the world to live healthful and vigorous lives. He was branded a "kook" and a charlatan by many, was arrested on obscenity charges, denounced by the medical establishment, and campaigned tirelessly against "pill-pushers," processed foods, and prudery. It is to the memory of Bernarr Macfadden and his many achievements that this web site is dedicated. The photograph below shows Macfadden when he was about 65! Preview my new book, FREE online: it's the true story of racial conflict in a small, Southern community in 1958. Two young boys, one white and one black, grow up during the civil rights era and confront prejudice, fear, and uncertainty. Experience for yourself the amazing transformational Power of Your Imagination! This site was created by Jim Bennett. Please request permission to use images and/or text.